Fashion Guggi SuperJanky by Guggimon is Here! Prepare to lose your collective shizzle when you check out the new SuperJanky that has dropped today from Superplastic! Following the fashion footsteps of Fashion Horror and Fashion Sewer SuperJanky by Guggimon, is the Fashion Guggi and boy does this fella ooooze style! Featuring a ‘Walt’ axe (used for destroying animated cartoon characters where they breed), the latest kicks, red handbag, and of course Guggi’s trademark stick & poke ‘GUG MOM’ tat! Whilst the previous Guggimon SuperJanky had the Janky ears, the new Fashion Guggi has new sleek rabbit ears. 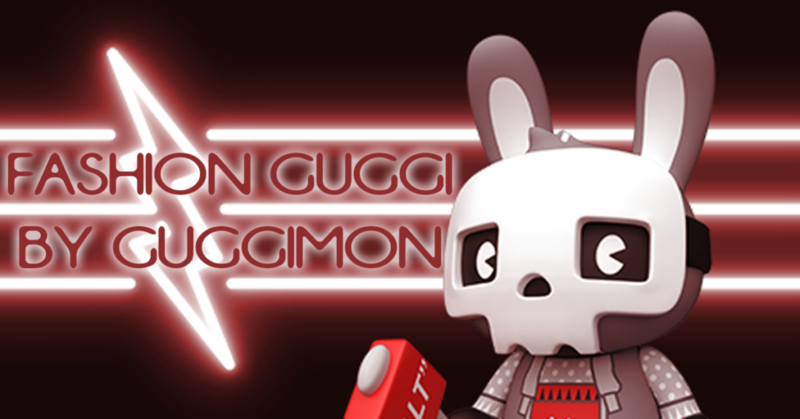 Created by international hip hop horror icon Guggimon, Fashion Guggi is limited to 333 pieces and is now available to purchase. Priced at $65 (about £50) for this 8inch SuperJanky. You can purchase on the Superplastic store HERE. Expect to ship in Fall/Autumn 2019. We love the colours chosen for Fashion Guggi. The mono colours that make the reds pop even harder!